We enjoyed this colorful tasty treat with fresh fruit and organic lavender from our garden on a hot summer’s afternoon. It only required a short time in the oven, and was really worth firing up the oven for. Bring the sugar and water to boil in a small saucepan. Place the lavender in a jar. Pour the sugar water over the lavender. Spray the tart forms with oil. Preheat the oven to 428 F / 220 C, or according to the instructions on the package. Thaw the puff pastry and on a lightly floured surface, roll the puff pastry out large enough to fit the forms. Pace one pastry in each form. Lightly prick the bottom of the pastry with a fork. Brush the bottom of the pastry with 1 teaspoon of lavender syrup. Evenly spread 1 tablespoon of almond flour on the bottom of the pastry. Cut the apricots and lay them decoratively around the pastry. 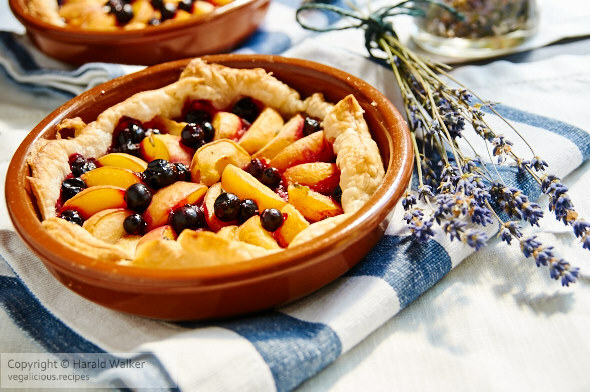 Sprinkle a few blackcurrants or blueberries around and once again brush some of the lavender syrup over the top of the apricots and berries. Place in the oven to bake for 15-20 minutes or until golden brown. Serve the tarts with some lavender syrup on the side. Make sure that you use organic lavender. Posted by Chris Walker on July 23, 2010 in Apricot, Blackcurrant, Desserts and Sweets.